The second book of the Backyard Witch series, by acclaimed authors Christine Heppermann and Ron Koertge, starring Ms. M, the witch who the Horn Book calls "a combination of Mary Poppins and a stand-up comedian." A must-have for newly independent readers and fans of Ivy + Bean, Clementine, and the Food Network! 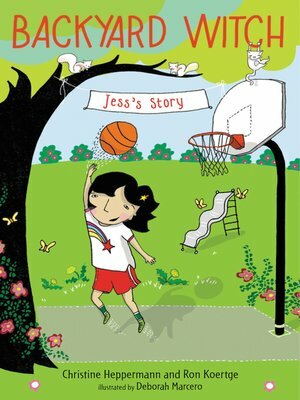 Jess is a superstar on the field and on the court. Soccer, basketball, baseball, tennis—you name it, she loves it. But she's a disaster in the kitchen, much to the dismay of her chef mother. When Jess's mom gets a chance to work in a famous kitchen for a week, Jess and her friends, Sadie and Maya, try to help out by making dinner. And . . . let's just say that it goes up in flames. Enter Ms. M, the mysterious witch who appears right when you need her! Ms. M is a heroine to rival Mrs. Piggle-Wiggle and Ms. Frizzle. She doesn't save the day herself, but she helps everyone save it for themselves. Short chapters filled with illustrator Deborah Marcero's striking, lively black-and-white illustrations make the Backyard Witch series a must-have for young middle grade readers. Includes a recipe and information about cooking and gardening.